Because Sea Cliff Cottage is located along the coast in La Jolla, Calif., builder Ryan Hill chose treated wood exterior trim boards from WindsorOne that are highly resistant to rot, insects, mold and moisture. 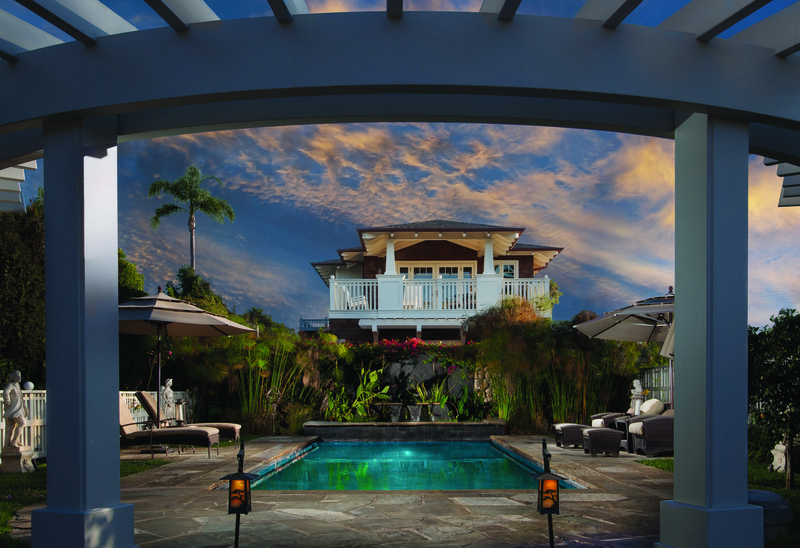 The river-rcck wall echoes the main residence, Sea Cliff (Photo: Larny Mack Photography). New homes in coastal areas are subject to an array of local and federal regulations, not to mention rules about height, setbacks, and even architectural design. Building materials have to be able to withstand the effects of sun, wind, water, and salt air. A more robust foundation and framing system is necessary to ensure stability during storms and hurricanes. 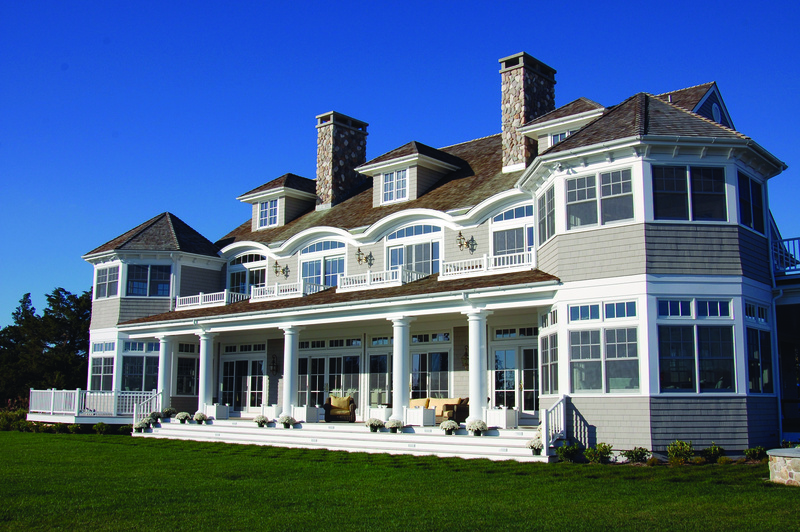 Custom builders who are experienced in coastal construction utilize impact-rated glazing and exterior materials that resemble wood, but don’t deteriorate like wood. Interior materials that have a greater tolerance for humidity are also incorporated. In fact, product choices play a big part in both the look and the durability of the three homes profiled here. Sea Cliff Cottage, in La Jolla, Calif., is a brand-new home that looks like it’s always been there, thanks to the efforts of builder Ryan Hill, architect Bill Hayer, and architect/interior designer Fred Gemmell. The 3,300-square-foot cottage is located on the same property as Sea Cliff, a 9,400-square-foot home that was completely renovated 10 years ago. The owners needed bedrooms and parking space for guests, but couldn’t enlarge the main house due to its status as a historic building. The two-story gueat house "nicely embraces the pool and privatizes the family outdoor space," says architect Bill Hayer. It also has ocean views (Photos: Larny Mack Photography). Although San Diego-based Hill Construction Co., didn’t remodel Sea Cliff, “we do a lot of historically designated projects, so creating custom materials and custom details to match an existing structure is something we deal with regularly,” Hill says. The overall site is long and narrow, with the main house on the bluff side at the very end of the property. An existing one-story Spanish Revival home on the street side was demolished. “We built a new two-story, Shingle-style cottage that relates more directly to Sea Cliff and creates a true estate feel,” says Hayer, founder of Hayer Architecture, in Del Mar, Calif. The cottage is decidely Shingle style with a little Craftsman thrown in (note the front porch columns). The cottage has two bedrooms, a living room with a fireplace, an eat-in kitchen, 2½ baths, a laundry room, a three-car garage, and wraparound porches on the second floor. When not occupied by guests, one of the bedrooms serves as a home office for the client. Hayer reduced the size of the second story to create an offset and decrease the overall mass. This allowed for a large deck off one of the bedrooms that overlooks the front of the cottage. In the rear is a covered patio that also breaks up the two-story mass overlooking the pool and takes advantage of ocean views. The cottage borrows various design characteristics from Sea Cliff including the roof shape; roof overhangs with carved rafter tails; Shingle-style window and door trim; the handrail design on the upper-level porches; and the use of river rock. “The most important thing was the material palette—the painted trim and the stained wood shingles on the walls,” Hayer says. The guest bedroom doubles as a home office for the client, who suspended his model trains from the ceiling. The builder selected an MDF product for the ceilings that has a significantly lower expansion coefficient than poplar or wood and offers better performance under humid conditions. Sea Cliff Cottage is in a coastal overlay zone regulated by the California Coastal Commission, which imposes specific regulations for the permitting, height, and size of new projects. The owners of this home on the North Fork of Long Island, N.Y., had vacationed there for many years and wanted a summer house that would also get some use as a winter holiday retreat for the extended family. 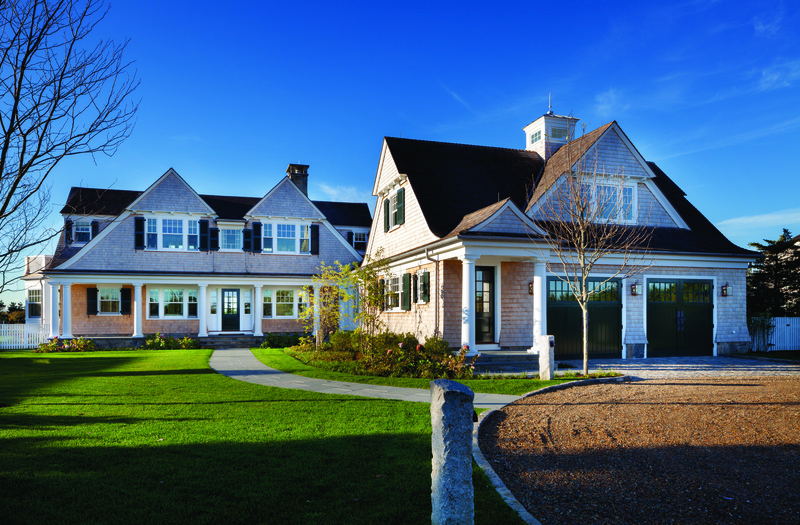 The front elevation of this Long Island, N.Y. home evokes traditional Nantucket seaside architecture with its sparkling white trim and wraparound porch (Photos: John Pace, Versatex Building Products, LLC). 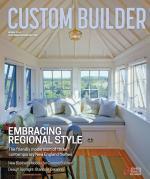 “They wanted a very traditional Nantucket seaside home with cedar wood shingles, which is characteristic of the North Fork as well as other parts of Long Island,” says John Seifert, president of Seifert Construction, in Mattituck, N.Y. “These homes take a beating from the water and weather, and their wood trim requires year-round maintenance.” Seifert chose PVC trim instead of wood for the exterior (see sidebar). 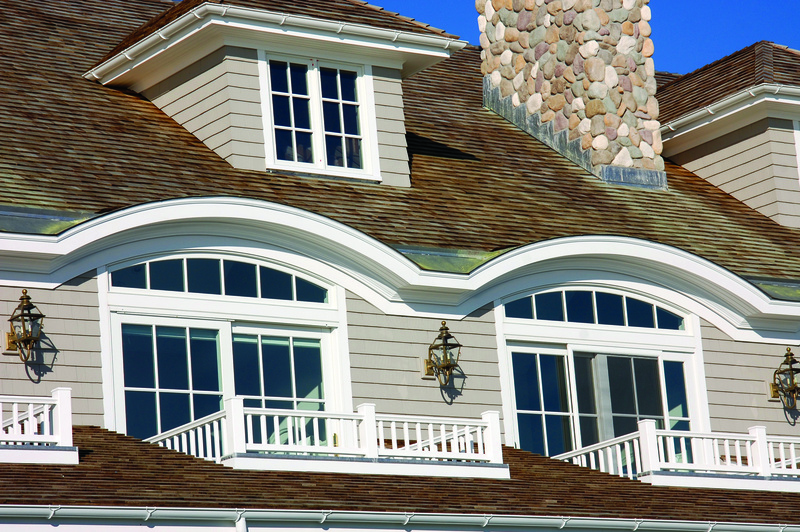 The clear cedar trim customarily used on homes on the North Fork of Long Island, N.Y., tends to rot after just a few years of exposure to sun, high winds, salt, and moisture. Also, clear cedar is a softer wood that typically gets dinged and dented during installation. 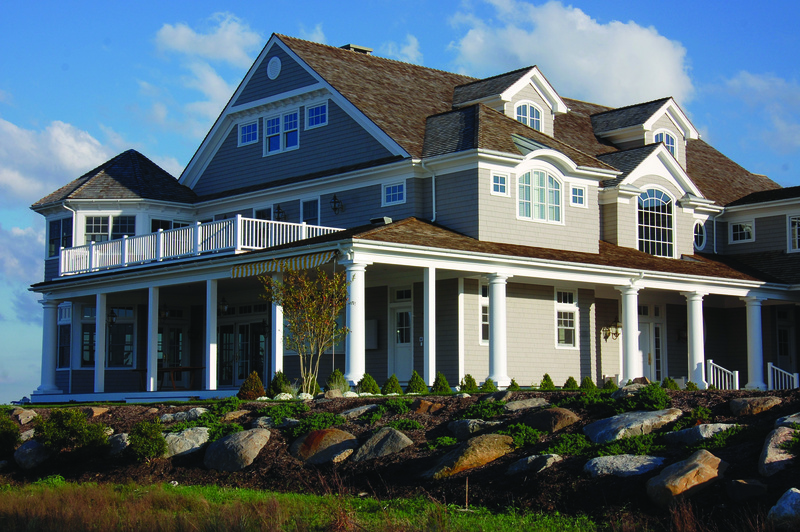 So for his latest custom home, builder John Seifert chose cellular PVC trim from Versatex. The home sustained no damage from Hurricane Sandy, whereas neighboring homes had badly damaged wood siding and trim. None of the trim was torn off. The exterior needed only power-washing after the storm. Seifert says he used more PVC trim, sheet, and moldings in this house than any home he has built to date. He was able to heat-bend the trim so that it follows the curve of the eyebrow windows. Every profile on the façade, down to the outdoor shower, was fabricated from one or more PVC profiles. It was even used as wainscoting in the bathrooms. Architect Mark Schwartz of Mark Schwartz & Associates, in Cutchogue, N.Y., designed the 8,000-square-foot home, which is about 100 yards from the water. While it’s on the bayfront rather than the ocean, the home is sited at the corner entrance to a large deepwater creek area. Both areas are strongly affected by tidal changes, in large part due to the sand and silt bottom substrate. Schwartz designed L-shaped main living areas that face north and east to capture panoramic water views. In addition, at the eastern and northern corners, the architecture incorporates a unique, multi-sided sitting room on the first and second floors that allows for maximum natural light via nearly 320 degrees of floor-to-ceiling windows. The home, which is elevated 4 feet with a landscaped berm, was constructed with a strapping and anchoring system that can withstand 120 mile per hour winds. Structural cross ties were designed for the second-floor ceiling areas, and thicker plywood was used for the shear walls. The basement has a perimeter drainage system with a series of pumps to exterior dry wells to control roof runoff, and a gravel driveway to reduce standing water. Other than family, friends, and guests, only boaters get to see the rear of the home, which builder John Seifert says is especially breathtaking. "There are jumbo-size columns holding up the porch roof, with the white trim everywhere and the eyebrow windows," says Seifert. 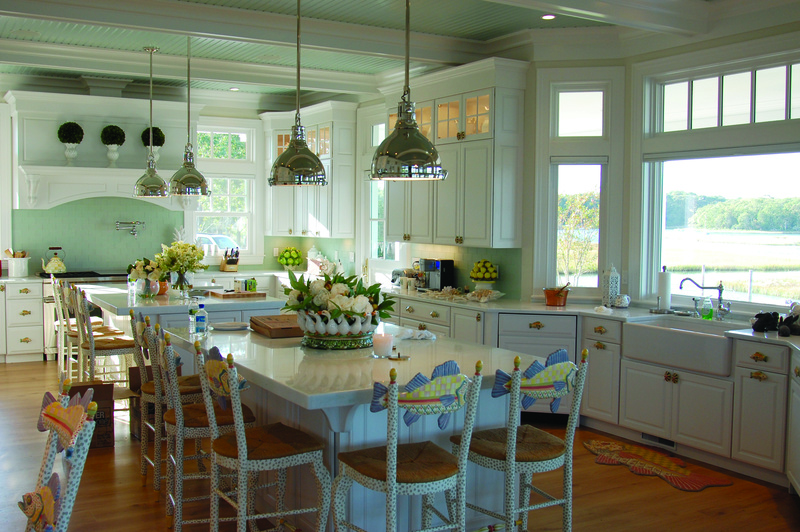 Designed for casual dining and entertaining, the kitchen has two islands and a bay window that overlooks the water. The first floor features 11-foot, coffered ceilings, a large, family-style kitchen, a grand curved staircase, a private office and laundry room, and a large deck with a screened porch that wraps around three sides of the house. Bedrooms are located upstairs for privacy. Another summer retreat, located on the south shore of Martha’s Vineyard, Mass., not only has ocean frontage but backs up to a creek. This meant that Boston-based architect Patrick Ahearn and Edgartown, Mass., builder Peter Rosbeck had to comply with conservation and zoning regulations as well as the requirements of a containment airport district overlay. They also had to pass a design review by the homeowners’ association governing that particular street. Instead of one huge house, architect Patrick Ahearn designed two structures for the 41/2-acre family compound: a 6,000-square-foot house and a 4,000-square-foot carriage house. Because they weather well, builder Peter Rosback used red cedar shingles for the roof and white cedar shingles for the siding (Photos: Greg Premru). Existing homes on adjoining lots totaling 4½ acres were demolished to make way for two new structures: a main house of approximately 6,000 square feet and a carriage house of about 4,000 square feet. “Due to a 30-foot height restriction and the topography of the nearby dunes, in order to get panoramic ocean views we located the primary living spaces of both houses on the second floor,” Ahearn says. The challenge was to create a Shingle-style island vernacular architecture that did not reflect the upside-down nature of the living spaces. Ahearn linked the two levels together on the ocean side and the pool side. "Between the house, the guest house, the pool, the cabana, and the outdoor fireplace with the pergola, there are all these wonderful places to enjoy the property and the view and entertain on multiple levels," says Ahearn. The clients, who have children and frequent guests and love to entertain, “wanted the house to be open and flowing so it would live in a modern way, and also have a more tailored look with salvaged ceiling beams and timbers in the living and dining rooms,” Ahearn says. 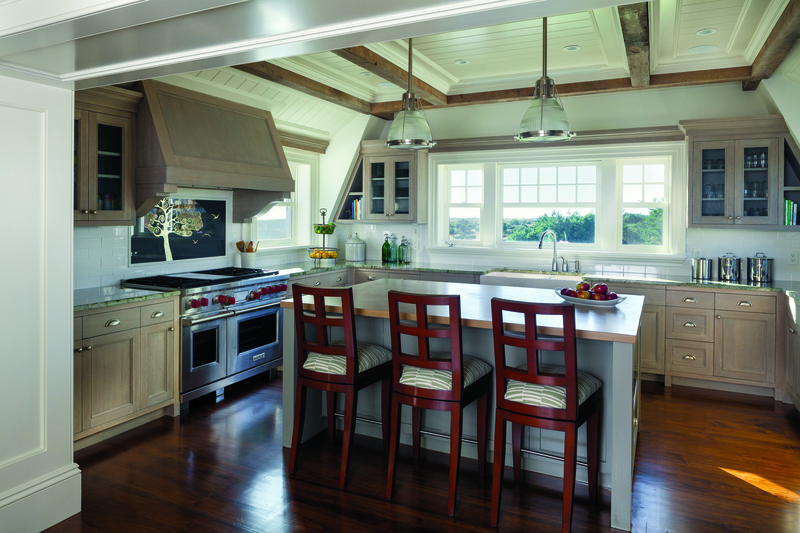 The ceiling beams and beadboard used in the other living areas are repeated here. 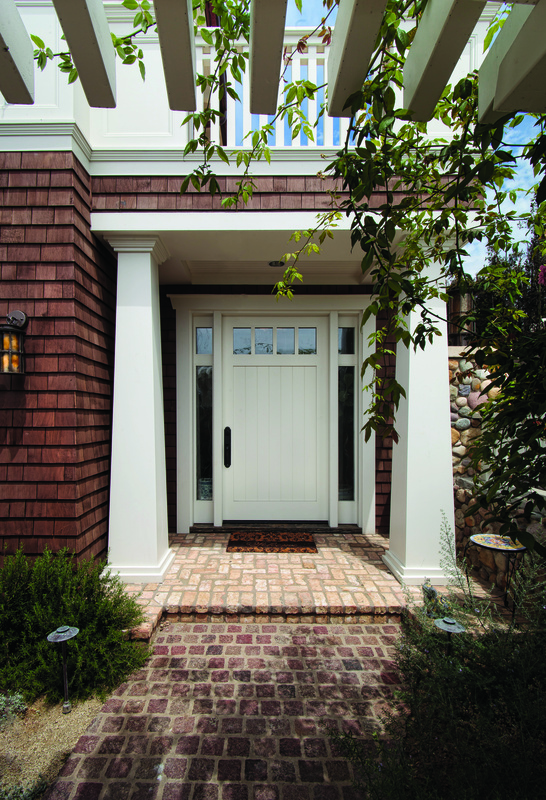 The project was named Best in Show in Marvin Windows and Doors’ 2014 Architects Challenge program. Marvin was especially impressed with Ahearn’s use of impact glass with simulated divided lites, and double-hung windows formed into bays. One rectangular window was outlined to make it a focal point of the elevation. Comments on: "Beautiful, Rugged Custom Homes Stand Up to Storms"